The gear worn by firefighters has a lot in common with the bullet proof vests worn by police officers. Of course both of these groups have different considerations and requirements for their protection, yet the ultimate goal is the same: to protect them against the threats inherent to the environments they work in. Some of these threats are the same, but even where they differ the methods used to provide protection necessitate the use of certain types of materials. Moreover, there is much that can be learnt on both sides by simply examining the protection used by firefighters and police officers, and the materials used specifically. The biggest difference between Law Enforcement and Firefighters is the main threat facing each. For Police Officers the main threat could be one of many things, and will vary greatly depending on where they serve. However, for Firefighters the main threat is fire; more specifically, heat. The gear Firefighters use (Turnout Gear) has to be able to withstand incredibly high temperatures, while also dealing with the myriad problems associated. Turnout gear and body armor usually involve the same materials, which are formed from aramids. Aramids, or aromatic polyamides, are strong, heat-resistant synthetic fibers. Their strength is the main reason for their use in body armour, whereas their ability to withstand high temperatures is the reason for their use in turnout gear. They are especially well-suited to high temperatures, as they have extremely low flammability and will not melt or degrade even at temperatures of over 800°F. Many manufacturers use aramids to make fabrics specifically designed to combat high temperatures and flames. For example, DuPont- the makers of Kevlar, a staple in body armour- produce a material known as Nomex, which is commonly used in turnout gear. The main difference between Nomex and Kevlar highlights the major differences between turnout gear and body armour; Kevlar has a far higher strength-to-weight ratio, at the expense of heat/flame resistance. In order to combat this, many manufacturers of turnout gear utilize blends of Nomex and Kevlar, which allows for incredible strength without the loss in heat resistance. Alternatively, some use higher proportions of Kevlar or Nomex according to the layer, with layers closer to the skin having a higher concentration of Kevlar to facilitate movement and comfort. The other major consideration for firefighters is the associated problems that the extreme temperatures cause. One of the greatest problems is a build-up of moisture, caused by sweat. Excessive sweating naturally brings with it severe physical issues, including dehydration, exhaustion, and even cardiac arrest. However, a build-up of moisture within the turnout gear also causes problems, such as severe burns caused by the moisture being heated to high temperatures. Moreover, if this moisture compromises the air barriers within the gear, it can compromise the performance and safety of the gear completely. The manufacturers of turnout gear adopt breathable and permeable layers into turnout gear, particularly in the layers closest to the skin, to ensure that moisture build-up is less of a problem. By utilizing materials designed to wick moisture away from the skin manufacturers can make turnout gear all the more protective. This is a problem that is also being tackled by the manufacturers of body armor, who often use similar materials. Creating protective vests that are as comfortable as possible is the main priority of body armor manufacturers, and so by incorporating breathable materials found in turnout gear, like CoolMax for example, bullet resistant vests become much better to wear. By combining these breathable materials with Kevlar the insides of turnout gear can not only be breathable and wick moisture away, but will help move heat away from the body whilst preventing outside heat from being absorbed through the layers. Another benefit of Kevlar is the reduced friction it brings, making the layers of turnout gear coexist much more easily. This also reduces any friction for the wearer, making it all the more comfortable. Both body armor and turnout gear manufacturers are concerned with finding new materials and methods of improving their products. The advances mentioned above have already gone a long way to keeping protective clothing as protective possible, yet there are a number of exciting new areas being researched. For example, creating materials that make use of semi-porous membranes allows for even better heat resistance and protection whilst facilitating the movement of even more heat and moisture away from the body. This has the added benefit of improving breathability while also offering increased protection against biological agents and industrial chemicals for example. This is especially important for those Firefighters called to industrial fires or natural disasters, where the potential range of threats is far greater. There is even research being undertaken into ‘smart armour' which can identify and protect against certain chemicals. Whilst these CBRN (Chemical, Biological, Radiological, and Nuclear) protective membranes are not yet a standard part of turnout gear, the NFPA 1971-2007 edition, which sets the standards for protection, already includes an optional section covering these threats. These developments will also be of benefit to body armour manufacturers, who can offer increased protection by using these potential materials. For example, work has been done by a manufacturing company associated with North Carolina State University to create discreet and flexible armour that can seal itself against hazardous materials, and then return to its semi-porous state. When not needed, this extra protection is simply not deployed, keeping it out of the way and not interfering while the wearer carries out his or her task. 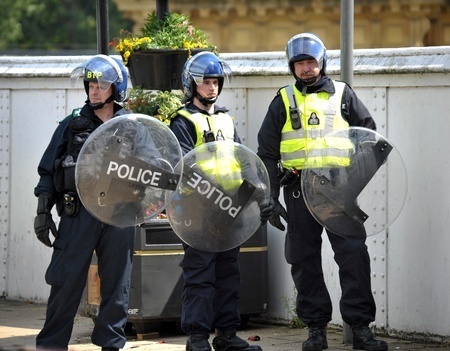 There are a number of similarities between body armour and turnout gear already, stemming from their role as protection for dangerous situations. It is only natural therefore that their research and development will be similar. However, with the development of new materials there will be requirements for additional testing standards and care for the products that use the materials. This could potentially make both turnout gear and body armor much more confusing, and much less accessible. However, by working in synergy with one another, and understanding the needs of both firefighters and those wearing body armour, these new materials can becoming exceptionally useful.